This record regarding the purchase of Through the Hills in May was found on the back of other records located in the Springfield Museum archives. It is worth noting that Through the Hills in May was purchase along with Under the Winter Moon from the 1922 "Twelfth Annual Free Exhibition Oil Paintings" put on by the J.H. Miller Gallery. George Walter Vincent Smith bought the paintings for his collection and while we have no record of a dispute regarding the price of Through the Hills in May, Under the Winter Moon is quite a different story. [Handwritten] Purchased by Smith from the artist through the J.H. 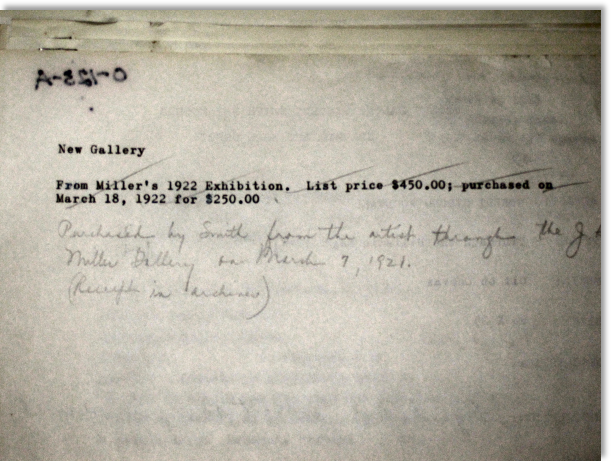 Miller Gallery on March 7, 1921.